A former owner of Russia's music website Allofmp3.com who sold cut-price downloads of Western music has been acquitted of copyright offences. A court in Moscow ruled that Denis Kvasov and his site had operated within the bounds of Russian law. The site was attracting millions of customers before it was shut in June - under pressure from US music firms. The site has also been a thorny issue in US-Russia talks over Moscow's bid to join the World Trade Organization. Mr Kvasov, head of Mediaservices, which owned the website, was put on trial after EMI, Warner Music Group and Universal music companies pressed for his prosecution. But District Judge Yekaterina Sharapova on Wednesday threw out the prosecution's case. "The prosecution did not succeed in presenting persuasive evidence of his involvement in infringing copyright law," she said. During the trial, Mr Kvasov successfully argued that he had paid royalties to a local organisation, the Russian Multimedia and Internet Society (Roms). The head of Russia's anti-piracy organisation, Konstantin Zemchenkov, said the court's verdict set a "very bad precedent". The site offered downloads at far lower prices than mainstream businesses like iTunes. A starting price for a track was as low as about $0.10, while an album was offered for $1. Mediaservices has always maintained it pays royalties to Roms, but many Western firms do not recognise this organisation and refuse to accept its offers of payments. As part of protracted negotiations over Russia's entry to the WTO, an agreement in principle was reached regarding website regulation in 2006. It said: "The United States and Russia agreed on the objective of shutting down websites that permit illegal distribution of music and other copyright works. "The agreement names the Russian-based website AllofMP3.com as an example of such a website." 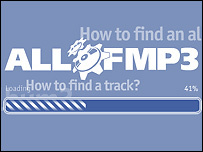 Although Allofmp3.com disappeared in June, another Russia-based discount music site opened shortly afterwards.